It's all kicking off! : It's all kicking off in Brecon and Radnor!!!!!!!!! It's all kicking off, a collection of the stupidest local newspaper headlines ever produced. It's all kicking off in Brecon and Radnor!!!!!!!!! The two greats of this genre are of course British comic institution Viz (who came up with the phrase "it's all kicking off" in the first place) and the seminal work "Whistable Mum in Custard Shortage". Having seen so many of these headlines scattered across the internet we thought it would be just smashing to put as many of these wonderful headlines in one place. Of course our greatest influences are the local journalists who surely have their tongue in their cheek when producing such classic headlines as "St Ives Boy Eats Éclairs with PM". It certainly is "All Kicking Off". IIt's all kicking off in Merthyr Tydfil!!!!!!!!!!!! It's all kicking off in the cage!!!!!!!!!!!!!!!!!!!!!!!!!! It's all kicking off in Exeter!!!!!!! 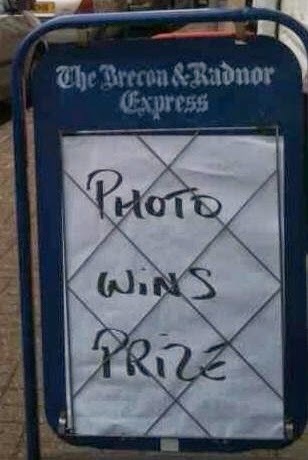 Its all kicking off in West Cornwall!!!! It's all kicking off down the registry office!!!! Old person uses computer shocker!!!!! It's all kicking off down the chippy!!!!!!!!! It's all kicking off near where I live...again !!!!!!!!!! It's all kicking off in Streatham !!!!!!!!! Reviews of the worst booze ever. It's all kicking off on CBEEBIES !!!!! It's all kicking off in the ditch!!!!!!! It's all kicking off down the aviary!!!! Find out about the real Father Christmas.